Our great uncle Michael Izzo married into the Mezzacappa family and acquired not only his wife, my great aunt Ethel, but four more sisters. All potential suitors had to be scrutinised by our great grandfather Nicola Mezzacappa, who could be, by all accounts, somewhat frightening and very protective of his five daughters. So having passed muster, you knew he had to be a decent man. My grandmother Anna, her older sister Maria Luisa and their parents were born in Morro d’Oro which is in the Teramo province of the Abruzzo region. The three younger sisters, Agnes, Filomena and Ethel, were born in Philadelphia after the family migrated in 1909. Like millions of migrants before and since, their food traditions were their connection to the motherland. Uncle Mike was a warm man who loved food and his adopted family. From what I remember he was often in the kitchen helping his beloved Ethel. It’s Mike’s pizzelle recipe that’s made its way from Abruzzo to Australia, via Philadelphia and Minneapolis. Pizzelle are a typical sweet from Abruzzo. I have also heard them called cancelle or ferratelle. They are like a waffle but made thin and crisp. You can also form them into little cones as you take them off the iron (there’s a special wooden tool for this) while they are still pliable. But you have to be quick as they become crisp as they cool down. My sister Annie acquired our grandmother’s pizzelle iron which had ended up with Mike and Ethel after our grandmother died. Uncle Mike dictated the recipe to Annie over the phone. She wrote it on a card and gave it to me on one of my trips to Minneapolis. 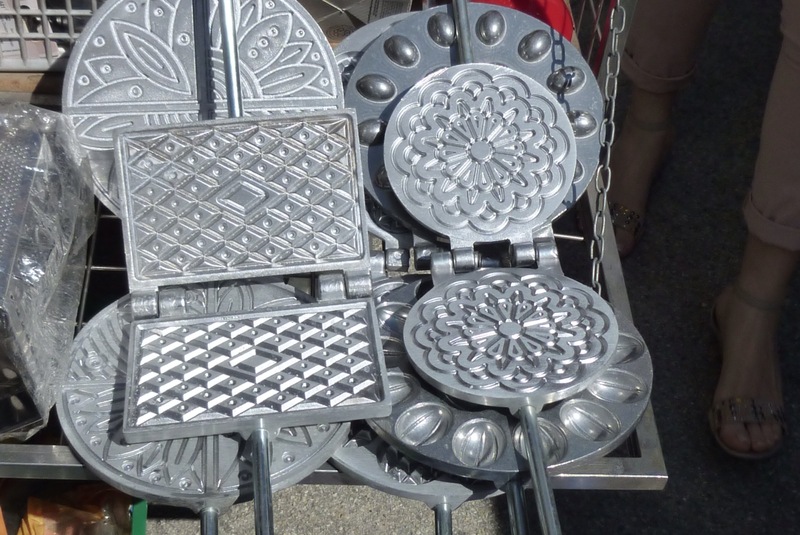 When we bought our pizzelle iron a trip to Roseto degli Abruzzi in 1998, we considered buying a modern electric one that makes two pizzelle at a time, but the single manual style was easier to transport around Europe and back to Australia. On a recent Saturday we needed a light desert to serve with coffee and tea. August is still officially winter in Adelaide and pizzelle always remind me of winter, each one looking like a snowflake. 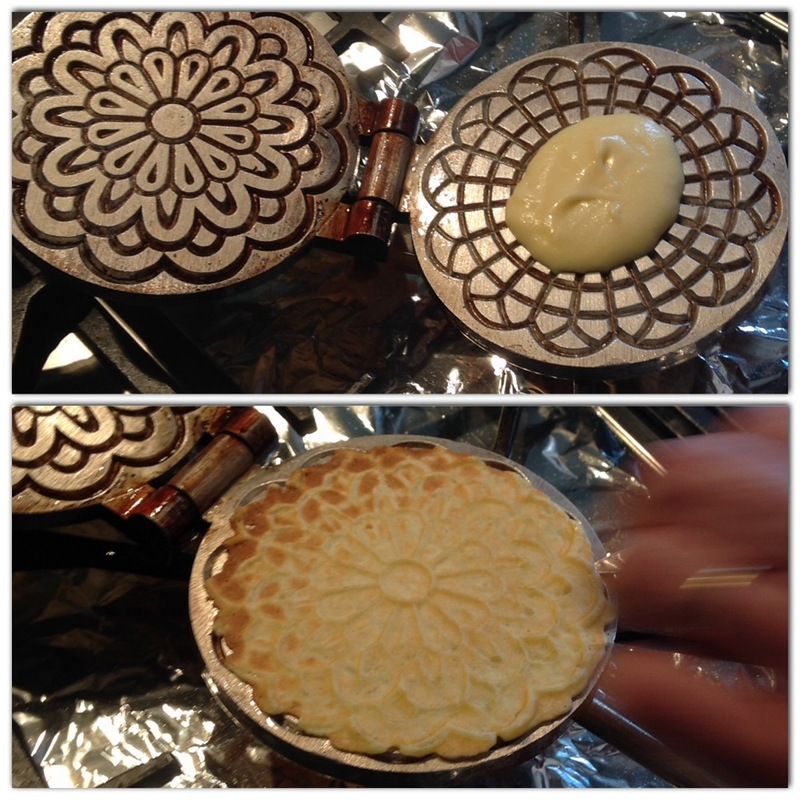 So, my husband got out the trusty pizzelle iron and in no time had made the perfect post lunch treat. Uncle Mike’s recipe calls for anise, and we usually split the recipe into two batches – in half the batter we substitute a splash of lemon and some lemon zest. I love both flavours. With salted caramel ice cream! Since we lack the tool to make cones (you can do it by hand) we just made ice cream sandwiches! And here’s the recipe. Enjoy! Heat the iron and brush or spray once with oil. Drop a tablespoon at a time of batter onto the hot side of the iron (if using a manual iron). Close the iron and cook for one minute. Turn the iron over for 20 seconds or so to cook the other side thoroughly. As the iron gets hotter, reduce the cooking time. You want each pizzelle to finish with a golden colour. Place the cooked pizzelle on a cake rack to cool so they will crisp up. 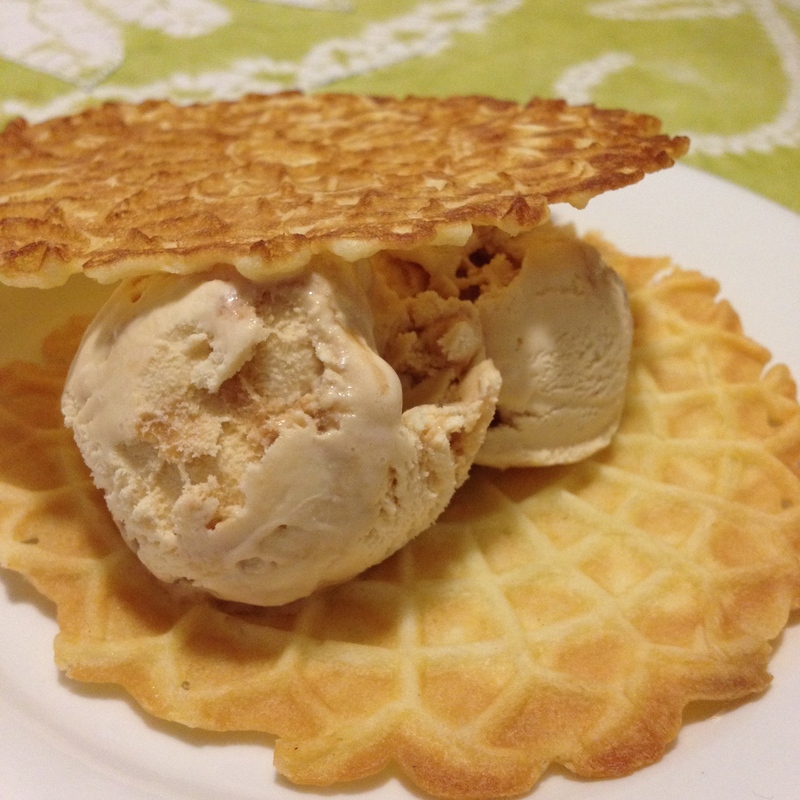 Once thoroughly cooled, pizzelle can be stored in sealed tins or containers for up to a month, if they last. Nice work Roo! I also have Uncle Mike’s scone recipe Lou. He told me he baked for relaxation, something I never knew till we spent a weekend with him with my children were young. He went out in the middle of the night to get some ingredient he was missing and we had them right from the oven when we woke up! He also fed my kids their first butterscotch krimpets that weekend. I think we need the scone recipe! Stat! Yum yum yum I haven’t made pizzelle in awhile and this makes me want to get the iron out. I have the electric one, with two molds but your post makes me want to start collecting the old-fashioned ones. Such pretty patterns. Thanks for sharing your family story. Oh, Domenica, it is a pleasure. It’s been such a voyage of discovery talking to my siblings and cousins to gather details of our colourful family. I’m learning how we all perceive people and events differently too. The biggest bonus is renewing connections along the way! I hope you have time to make some pizzelle memories real soon! I would like to thank you for having this receipe . My mom used to make pizzelle all the time and since her passing I haven’t found the way to make them like she did. My girls will love them so thank-you again . I got to you through Domenicacooks so thanks to her to. Grazie for your comment Felicia. It looks like you are in Canada. I hope you can find the iron to make the pizzelle. If you have your mother’s iron that is great! If not you can probably buy one online or at he italian districts in the eastern Canadian cities (surely in Toronto!). Enjoy your pizzelle! Hi Julie, Yes, It’s literally in my blood. I grew up in a big Italian family (half actually, just my mother’s parents were born in Italy, dad’s side Liverpool, Ireland and Germany). So big noisy tables, talk about food, dipping bread in sauce pots, clams and pasta, Antipasti and Lasagna instead of roast dinners for Christmas. I can’t wait to go back next year.